Do we really underestimate the healing power of herbs? I doubt. As far as Indian cooking is concerned herbs play vital role in any regional cooking. Ayurveda, an ancient Indian medicinal form, emphasises on the healing power of herbs and spices. Since generations many families in India have been following knowingly or unknowingly the concept of cooking with medicinal herbs and spices. While growing up I have seen my mother using herbs in many avatars. She starts her day with herb infused teas and ends by taking fresh herbs and spices for its medicinal use. In between, the herbs are used in recipes not just as garnishes but good handfuls for enhancing flavours and also for their healing power. One such herb which I use quite often is fresh Coriander which imparts a bold sage and tangy citrus effect to many dishes in ethnic kitchens. It is almost impossible to see food in Indian restaurants and home without it. It makes its presence felt in a form of dried aromatic seeds or ground powder or in its vibrant green leafy form. It is said that Coriander was named after the bedbug, because it emits the same unpleasant odour as its namesake. What?? Unpleasant odour??? I strongly disagree as the heady aroma of roasted coriander seeds and chopped fresh coriander leaves is one pure pleasure for all your senses. May be that’s the reason I end up adding little extra handful of coriander leaves and extra pinch of coriander powder in almost all the dishes I cook. After all it is a wonder herb for acid indigestion or upset stomach. 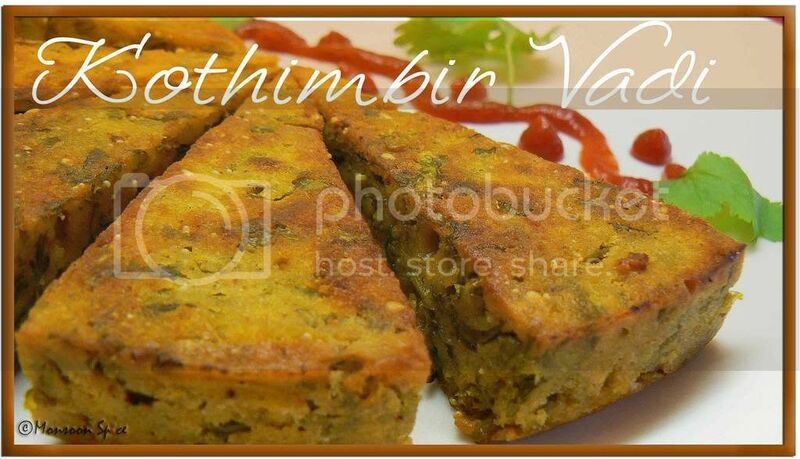 While browsing through Nupur’s One Hot Stove for T&T, I came across this recipe of Kothimbir Vadi. 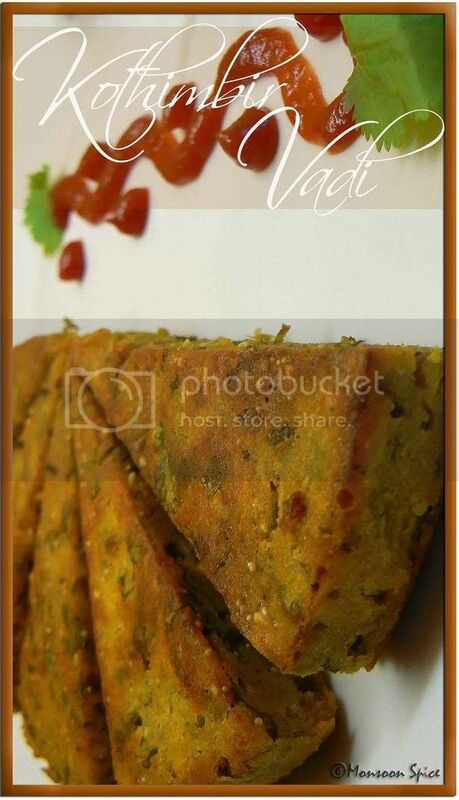 One look at them and I had serious cravings for this delicious vadis. And another point that got my full attention was the fact that Coriander is the main lead in this recipe instead of playing a cameo role as a garnish. This recipe is a best example as how simple herb can be used as main ingredient and yet will not end-up tasting herb-y (I know it’s not even a word, but couldn’t think of anything else ;). Other main equipment needed for this recipe is a steamer. I used pressure cooker without the “weight” and fried them in little oil till they turned golden and crisp. And boy! What a tasty vadis they turned out to be. Aromatic, crisp from outside and soft from inside, they were devoured in no time at all. We had them as an evening snack with cup of coffee and also as a side dish with Sabudana Kichidi the very next day. 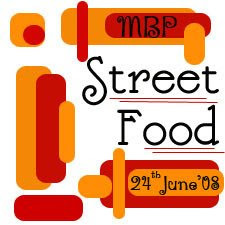 Thank you Nupur, for introducing us to another wonderful Marathi dish. 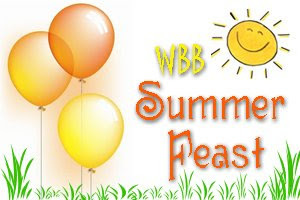 Off this delightful crisp vadis goes to dear Kayln who is hosting this week’s WHB a.k.a. Weekend Herb Blogging. Mix all the ingredients in a bowl except the oil. Add little water at a time to get a thick batter. Make sure that you remove any lumps former. The batter I made was that of any Pakoda/Bhajji batter consistency. Grease a flat bottomed vessel with oil and pour batter into it. Steam it using a traditional steamer or pressure cooker without its weight for around 20-30 mints over a medium heat. The skewer inserted in the middle should come clean when it’s cooked properly. Let it cool properly before you un-mould it. Cut it into desired shapes. I cut them into wedges. Now you can either serve it as it is or continue with next step. Heat about ½ cm of oil in a pan and arrange these slices. Cook on both sides till they turn golden brown and crisp. 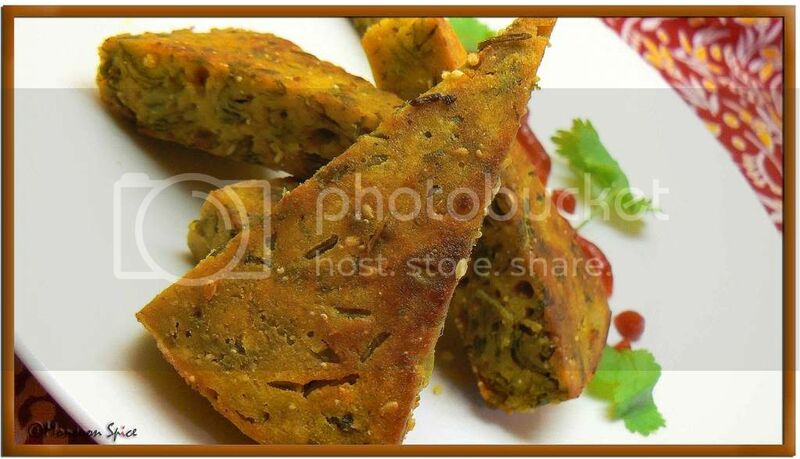 Serve these Kothimbir Vadis as snacks with any chutney or sauce of your choice or as side dish with Rice and Dal and enjoy. My favorite accompaniment to simple dal and rice :) Thanks for trying this recipe, dear Sia! slurp!! drool...that sure looks yummy sia! :-) great presentation, no doubt..and the pictures...? awesome! Ah, I have some besan at home that I need to get rid of - I first saw them a couple of years ago in Bombay and was so fascinated by their shape - those were cut into squares. Perfect snack for a rainy evening,i love to enjoy this with a hot cup of ginger tea.These vadis take me to the era when i was in school,and whenever my father would leave early from office ,he use to bring these ,and we all used to relish vadis with tea and enjoy a hearty conversation...aah.... those golden days of my life! These look delicious, Bookmarked to try. Absolutely gorgeous picture!!! Love it. My mom used to make these. I miss them now. These look delicious. Wow, This looks so yummy. I just feel like grabbing one from the picture . these are very new to me..looks damn good..love it..look just like crispy cake pieces:)..
Nice pics.That is a new dish I havent heard of..
we've tried this and loved it. Hey! I have made and eaten this many times but your pics look so good I feel what I made was not the right thing! PERFECT! Sia, that is a perfect snack. The way you describe them makes it more than just delicious. What a delicious sounding dish. I'm positive I'd like it (well of course the cilantro certainly gets my attention! Your photos are really great too, droolworthy! i am making this today....thanks for sharing the recipe. Looks so yummy !! wonderful Pictures Sia!! Feel like having this vadi right now :)!! Shape is so perfect steamed and fried.. my mother makes it.. yummy !! that looks so lovely and non-oily cuz of the steaming!! Boy that looks so good Sia ! I first thought it was deepfried but I love this steaming + pan-frying method.